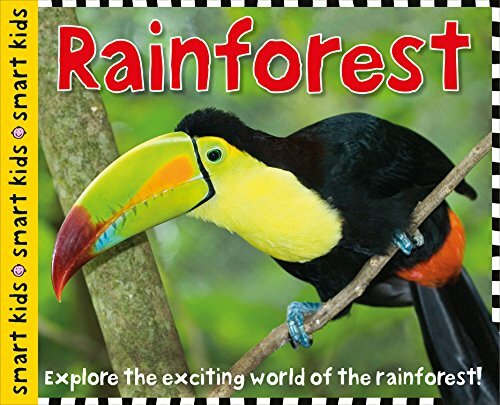 So, there was this one time I was driving through a rainforest with my family on a narrow road (one driving lane, with two directions of traffic) and another car needed to get past and we had a piece of our tire hanging off the edge of a cliff…. do I have your attention yet?!?! So obviously we survived, but, my oh my, what a memorable experience! 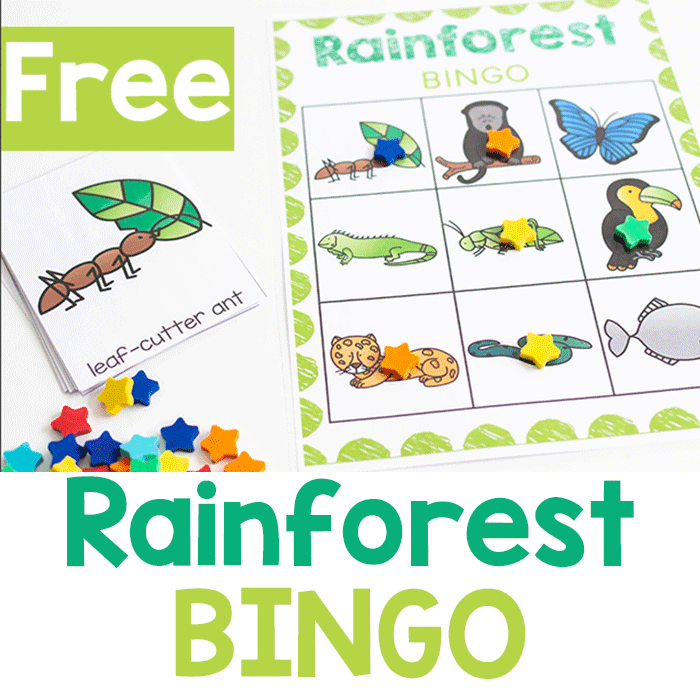 This Rainforest BINGO game is a much safer way to explore the Rainforest! 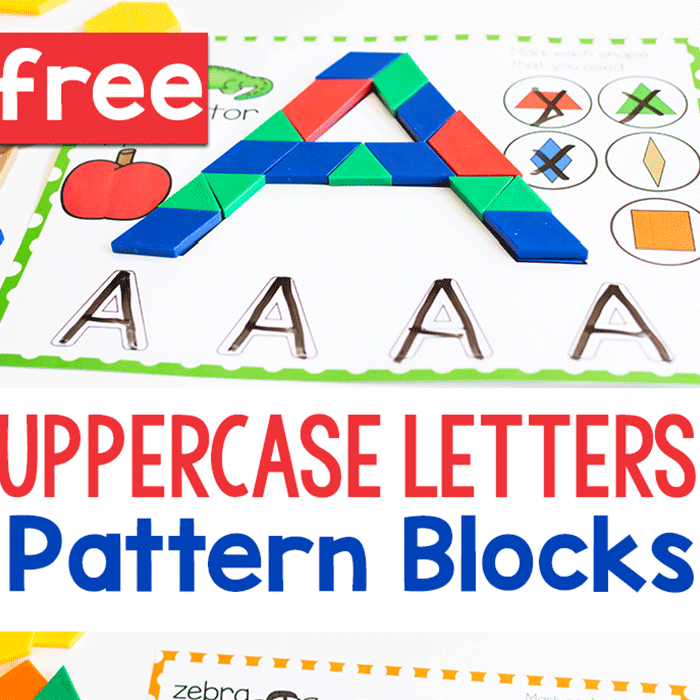 It’s the newest in our collection of more than 250 free printables! 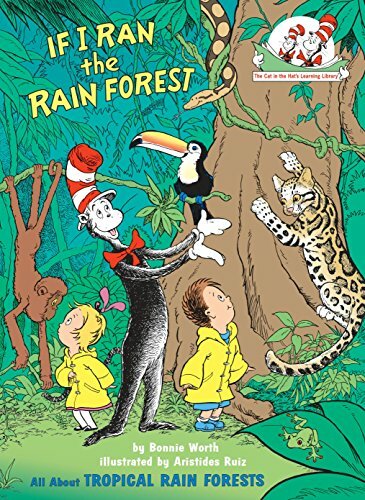 I bet you didn’t know that there is actually a small rainforest in the Republic of Georgia. We lived over there for 9 years and until we started driving down that crazy one-lane road, I didn’t realize it either. 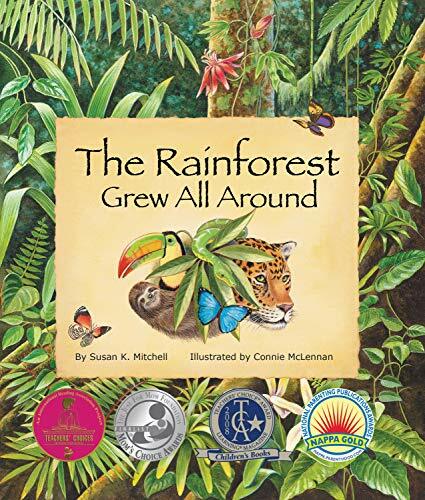 It didn’t have all the wildlife that the Amazon Rainforest has, but the ecosystem was very much the same. Raining multiple times a day when areas around it were perfectly dry! 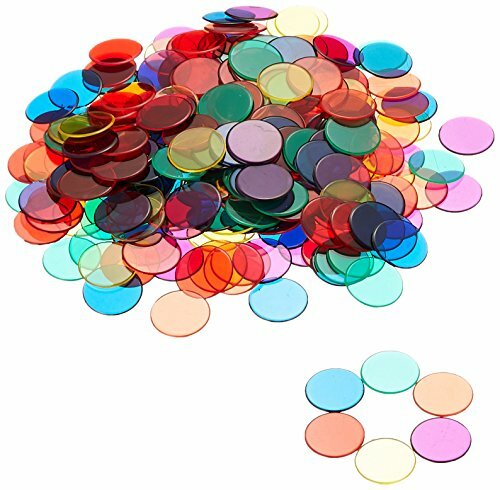 Whether it is with numbers or animals, daubers or manipulatives. 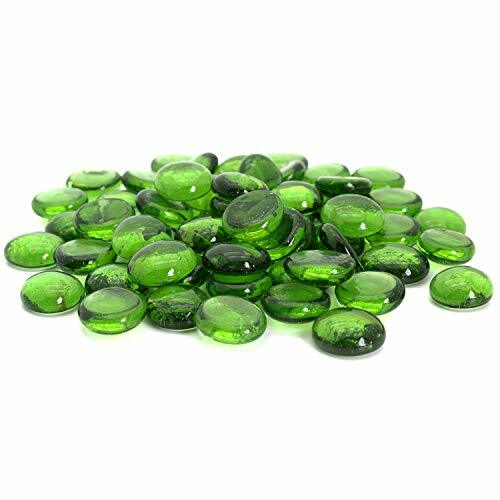 Bingo is an energetic, fast moving, versatile game that can be played over and over without boredom setting in! 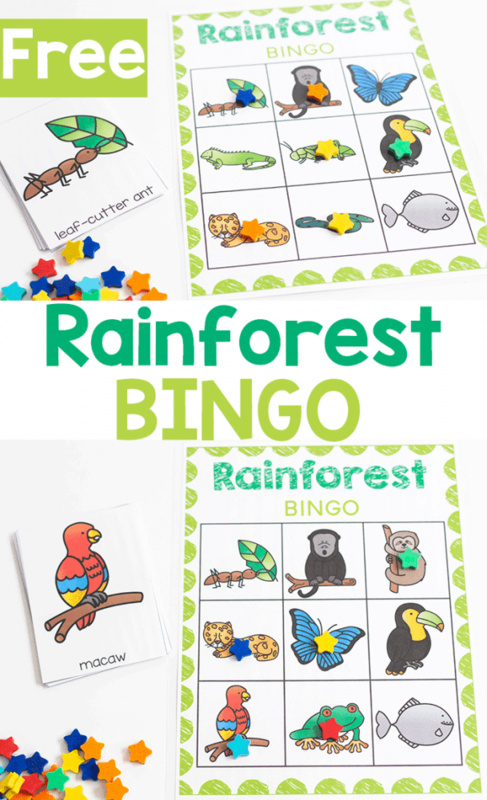 This particular Rain Forest Animal Bingo game is perfect for students from preschool through even 2nd grade! The animals are fun yet realistic. The colors are bold and bright. This makes this bingo game extra fun! It will require memory, which is great, because there aren’t the animal names on the board to help them identify the animals. 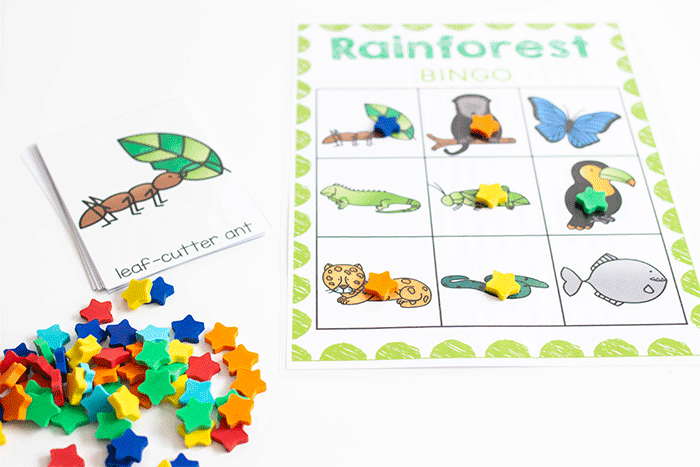 This is fantastic for ensuring that students actually know what the animals look like. Some of my favorite activities are ones that you prep once and can play for ever and ever without having to do more prep work. This is one of those types of activities. Once you have set it up once, you can set it up again with no warning! There are 10 different bingo boards and the calling cards. The first thing I do is print out all of the pieces. I like to laminate all of these pieces, both the bingo cards and the calling cards. 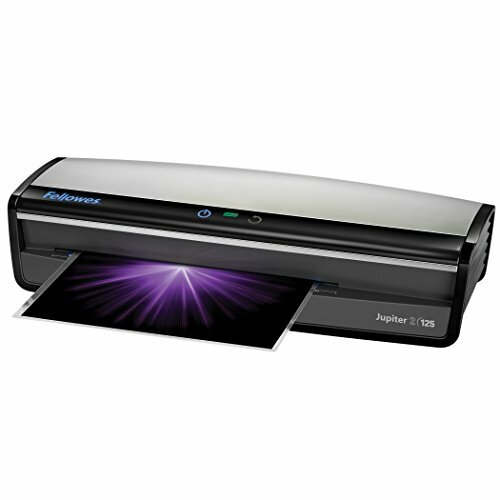 Laminating will extend the life of the activity and make sure that they can’t get ripped, bent, or spilled on. We all know how easily that can happen. You turn for a second or even blink..all of the above will happen. HA! 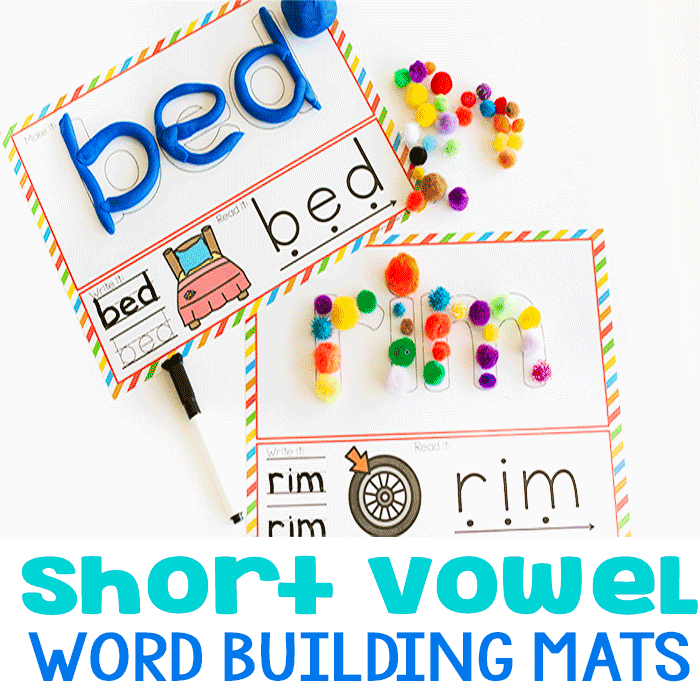 So I just laminate and not worry about it! Next, cut apart the BINGO calling cards after laminating. Pro tip: I have had injuries to my wrists, so cutting gets tedious very quickly. 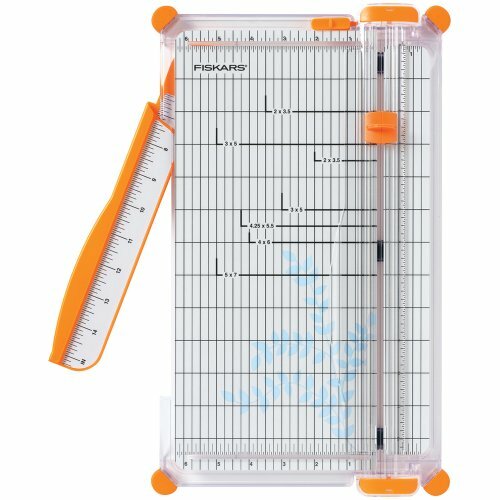 So, instead of scissors, I rely on my paper trimmer to do all the work. The next step is to PLAY! Playing is easy too! 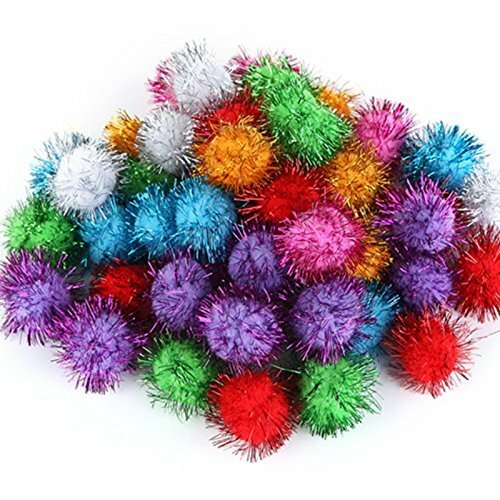 Each child gets a bingo card and a pile of pom poms. 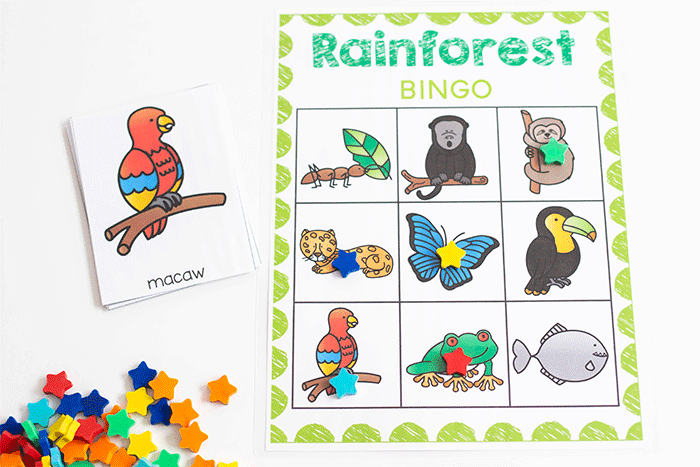 You can use pretty much anything to cover the pictures on the bingo sheets. 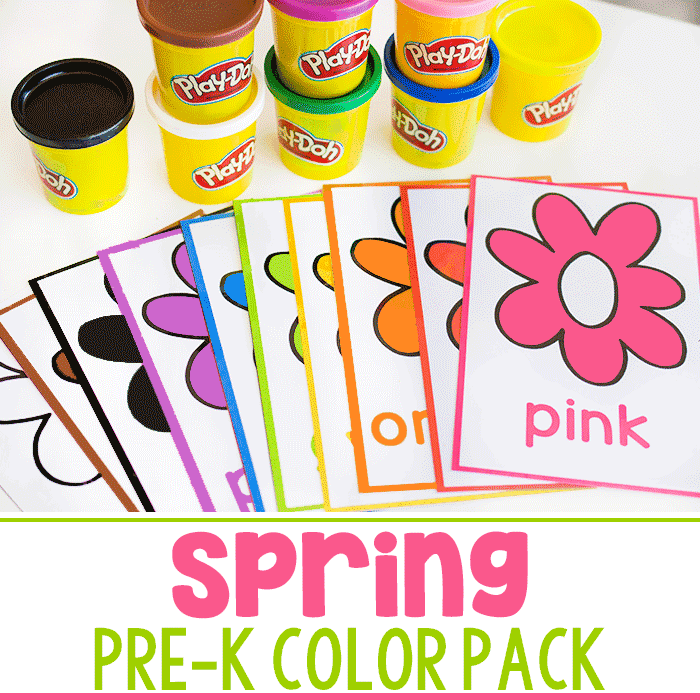 We have used candy, coins, beads, or even a dry eraser marker or crayon to color in the square. You can use the calling cards to randomly call out a different animals. When you call out the animals, children will search on their board. If they find the animal, they will place a marker of some sort over that animal. The game continues as such until someone has an entire row covered. This could be across, down, or diagonal. 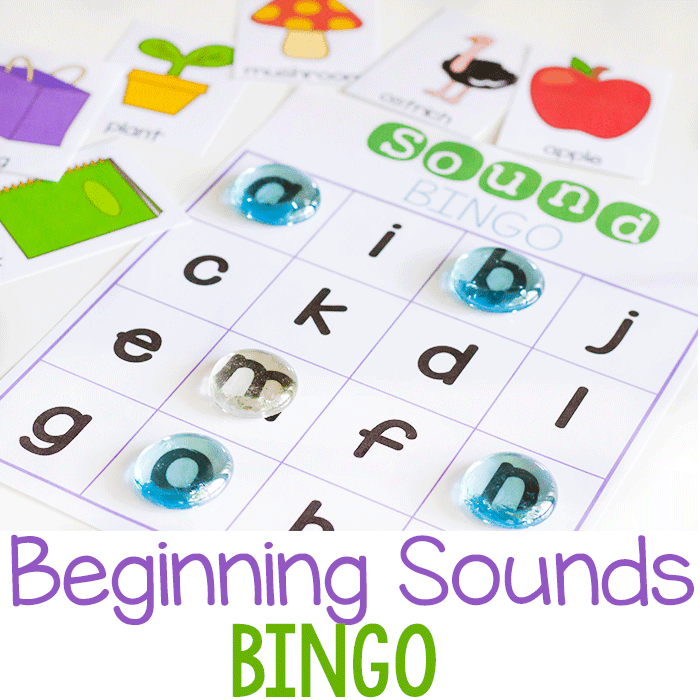 At this time they will call out “BINGO” and they are the winner. We have used the same concept but requiring the whole board to be filled, versus just a row. 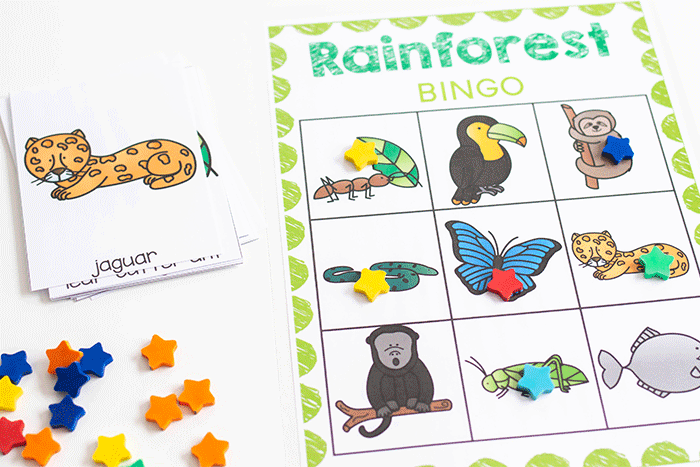 Include fun facts when each animal is called. Ask children to recite facts, if they have been talked about before. 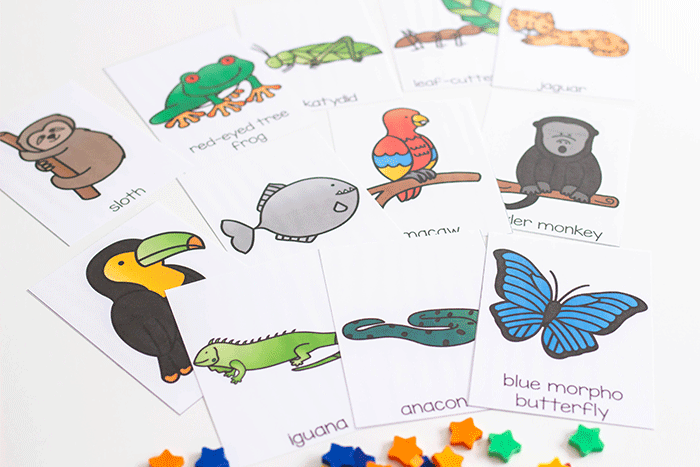 Print two copies of the animal cards and use them as a matching game. 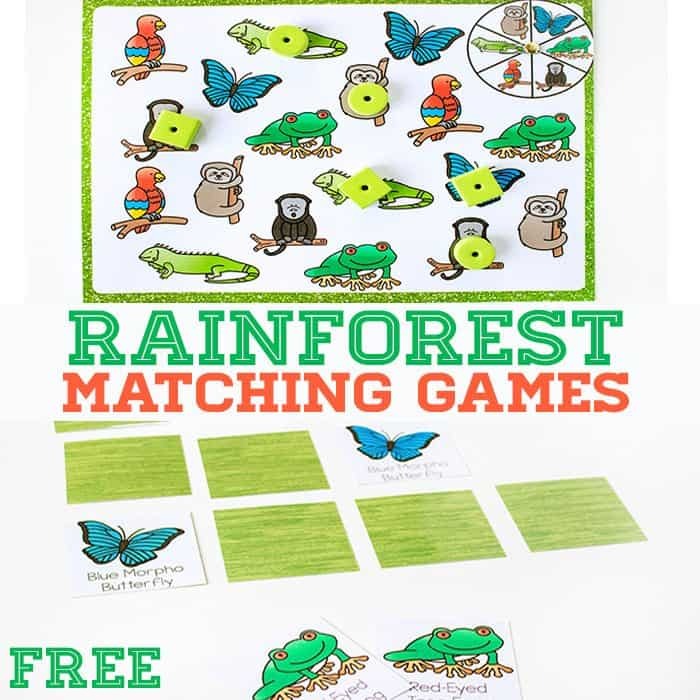 Or grab these fun Rainforest Matching Games. 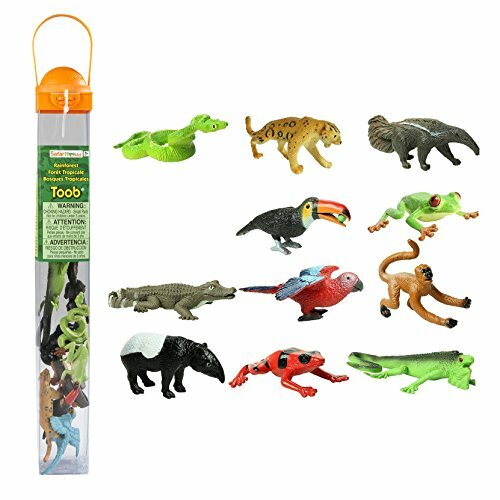 Use the Rainforest Safari Toob animals and match them to cards.